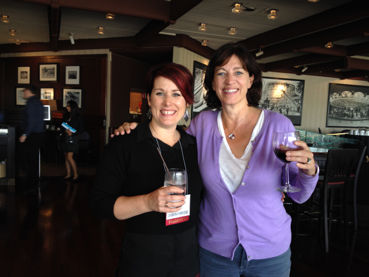 Any of you who know me or have attended my workshops in the past few years know that I’m a huge fan of Jo Boaler. She is my math ‘guru’. I’ve read all of her books, papers, website articles, etc. I’ve used her tasks on www.youcubed.org and recommended her book Mathematical Mindsets to every teacher and parent I meet. I had the opportunity to meet Jo a few years ago when we were both presenting at the Northwest Math Conference in Portland. I got about half an hour with her to talk math and I was as giddy as a teenager meeting her favourite celebrity (I tried very hard to play it cool while we met but you can see from the picture that I’m ridiculously excited). Needless to say, when I found out in August that she was coming to Richmond on February 23, I signed up immediately and had been looking forward to it since the summer. Eight teachers from my school also signed up so we were excited to all learn together. Then, we got an email on Wednesday night letting us know that Jo was too ill to travel or present BUT Cathy Williams, her co-founder of youcubed.org and co-presenter was still able to come and would give the presentation. I had a few colleagues ask me if I cried. No, I didn’t, and I figured that it would still be a very worthwhile presentation as Cathy is an expert in the field as well. What I didn’t expect was just how amazing Cathy would be! She is an excellent presenter; funny, quick paced, articulate, knowledgeable, relatable, authentic….awesome! What a fantastic day we had! I was challenged with tasks that I found very difficult, thought differently about research findings I had previously interpreted a different way and talked with other teachers about the various challenges and success when incorporating these ideas into our teaching. Because I have read so much of their work, there wasn’t a whole lot that was brand new to me but there were certain things that I now understand better or differently and it is always great to reinforce and be reminded of the important messages. This blog is dedicated to my biggest ‘take-aways’ from this conference. There is a lot of misunderstanding about the use of fingers in math. I was told at some point in a professional development session years ago that students should NOT be counting on their fingers…but this is not necessarily true according to the research shared by Cathy. It turns out that fingers are incredibly important in math for many reasons. There is a part of the brain that is used for math that is directly related to our fingers and is activated when we calculate arithmetic symbolically (whether we use our fingers or not). We were also shown research that shows that greater finger perception is a better indicator of success in elementary school than standardized tests. Finger perception is having an awareness of your fingers. One quick way to test this is for students to hide their hands under their desks so they can’t see them, another student touches one of their fingers and if the student can then show you which finger was touched, they have finger perception. Finger perception can be taught and practiced with children to help them strengthen this part of the brain by using finger mazes and matching fingers to piano keys (on paper or real). Here are some examples from Cathy and Jo. Fingers are really important to use with younger students for: representing numbers, counting, adding, subtracting, skip counting (also multiplication). I encourage kids to use them for counting by 5’s or 3’s or hundreds, etc. Fingers are a built-in manipulative in this sense. 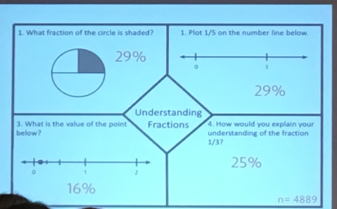 A big message I heard over and over throughout the day was that we need to support our students (and learn this for ourselves) in connecting their abstract math (located in the front of the brain) to visual math (located in the back of the brain). The tasks on www.youcubed.org are designed to do this. Manipulatives, number lines, and grids also do this. We need to help our students to visualize math as often as they do abstract procedures – this isn’t either/or but both. Thankfully our curriculum is designed for this so this is all integrated into what we’re supposed to be teaching anyways (as opposed to something extra to pile on!). Phew! Also, all of our videos on www.educatingnow.comare based on visual models and are designed to strengthen this important abstract-visual connection. Now, that being said, I feel the need to clarify that we also want students to progress far beyond counting strategies (the most common use of fingers is for counting by 1’s, thus a counting strategy ). Starting in grade 1 and building onto this in grade 2 we want students to be using additive strategies for adding and subtracting and then multiplicative strategies for multiplication and division (in grades 3 and above). These strategies benefit students in arriving at answers more accurately and efficiently, but also allow for more flexibility AND translate into developing number sense – and are actually strategies that transfer to algebraic properties that will be useful for them in later years of schooling. So all of this means that we don’t want students counting by 1’s on their fingers as their primary means of adding numbers. Instead, we work on bridging to 10, doubles, near doubles, etc. In addition, we want to encourage strong finger perception (especially in young students) and to constantly be connecting the visual math to abstract math. And in case you are wondering, yes, this is why learning to play musical instruments is so great for mathematics learning! This is what Educating Now is all about! Cathy made some great suggestions like painting number lines, 100’s charts, etc. on the school grounds (no need to create games for them as students will play their own). The more they are exposed and literally SEE math, the better. Using manipulatives, models and drawings are vital to connecting all the parts of the brain involved in understanding mathematics for maximum achievement. All mathematical concepts can be paired with a visual and this is often what has been missing in traditional math instruction. I’ve mentioned this in so many previous posts and in my TEDx talk. Our society is in dire need of a revolution in terms of how it views mathematics. Math is a tool that is designed to help us solve problems and make sense of the world around us – not a series of abstract questions from a worksheet or textbook that people can ‘do’ without any understanding whatsoever. In order to change our culture from one where math is often feared or deemed only accessible to those with the ‘math brain’, we need to educate not only our students but also our colleagues, parents, and community members. Teaching about the growth mindset, and the myth of the math brain and using evidence-based teaching practices will encourage all students to see themselves as capable mathematicians. When we value thinking, mistakes, learning and understanding over speed and performance, we will see a significant shift in the ‘math culture’ of our classes and schools. When we see math anxiety and fear of math, we must address this first as this fear prohibits the brain from learning! I can’t tell you how often I encounter parents and students who want to move onto “harder” or “more advanced” math because they are procedurally strong, yet they are unable to show their math visually or explain how and why it works. This is also a by-product of our current culture of math (valuing finding the answer over understanding). If you don’t already incorporate visuals into your assessments, I strongly encourage you to do so – I promise it will be illuminating! Previous PostPrevious Art & Math? Who Knew?! ?